ysabetwordsmith | Poem: "Fears You Didn't Know Existed"
Poem: "Fears You Didn't Know Existed"
This poem came out of the January 3, 2017 Poetry Fishbowl. It was inspired by prompts from gingicat and rix_scaedu. It also fills the "panic" square in my 1-1-17 card for the Dark Fantasy Bingo fest. This poem has been sponsored by the general fund, based on an audience poll. It belongs to the series Polychrome Heroics. Warning: This poem contains some touchy topics. Highlight to read the warnings, some of which are spoilers. It features a lost toddler and a panicking mother. Everything turns out fine. However, parents or people with navigational challenges may find this stressful. If these are sensitive issues for you, please consider your tastes and headspace before reading onward. "Fears You Didn't Know Existed"
"This is Irie Rudimon," the woman said. everywhere and I can't find him." "Okay, thank you for calling SPOON,"
Groundhog said as he tapped into the files. had flickered through several innocuous talents. right over. They should reach you within five minutes. Please stay on the line with me while we fix this." "Thank you. Thank you," said Irie. I don't know how to handle this." called for help and we'll get you through this. and dealing with fears you didn’t know existed." Irie gave a ragged laugh. "You said it." let's get you calmed down some," Groundhog said. "Find a safe place to sit. Put your feet flat on the floor. Put your hands on your thighs. Breathe from your belly. the guys when they get there, and find Kenny." "Like meditating," Irie said. "Okay. I'm not great at it, but I can do some." grateful that she was settling down. "Oh! They're here," Irie said. and Irie on the left. "Afton, report," he said. hear the grin in his voice. echoed on hardwood as he walked. "Yes, he does that," Irie said. but I really did look everywhere." in the closet," Afton said. "Where?!" Irie said. "It's empty." "Mommy, look, I'm all clear!" "Here, you take him now." "Good job, Afton. Keep me posted." "Mommy, am I weird?" Kenny said. last week," Irie said gently. "It's just ... what do I do now?" Irie said. "I feel so lost." keep track of Kenny," he suggested. "Oh, that's the good idea,"
"They'll be fine," Afton said. give Irie some family resources. I'm ready to leave here." taking care of this, Afton,"
marked the call a success. "I love my job," Groundhog said. Irie Rudimon -- She has golden-fair skin, almond-shaped brown eyes, and straight black hair to her chin. Her heritage is mixed Asian and American. She worked in daycare before starting her own family, and currently stays home with her toddler. She is pregant again but not showing yet. She loves hunting Book Crossing releases, and spends plenty of time exploring Onion City with her son. Ken "Kenny" Rudimon -- He has pale skin, almond-shaped blue eyes, and short blond hair. His heritage is mostly American with a little Asian. He has been flickering, and just manifested Invisibility but with no control. Origin: He has Super-Immunity from the Aegis vaccine. Other superpowers are flickering now. Motivation: Run and find out! Afton Forestron -- He has fair skin, brown eyes, and short brown hair with a mustache and beard. He works as a ranger for the Onion City park service, also volunteering with the Activity Scouts and SPOON. His abilities stack beautifully to make him an outstanding tracker. Origin: As a boy, Afton was bitten by some unknown pest at summer camp. He got sick enough that he had to go home early, which really upset him. After that, he developed superpowers. Uniform: On duty, he wears the Onion City SPOON uniform of a navy blue shirt and pants with the SPOON logo embroidered in silver on the chest pocket. Off duty, he wears outdoorsy clothes. Motivation: To teach people about nature. Parents naturally worry about losing track of their kids. There are ways to prevent kids from getting lost and cope with them getting lost. However, these are for ordinary kids. I can tell you from personal experience, they are nearly useless for metaphysical things like drifting out of phase with consensus reality. It is possible to hear a smile over the phone. Lacing cards have holes for toddlers to thread a string through. You can buy them or make your own. Here are some printable lacing cards. Toddler harnesses have pros and cons. For special needs families, a harness can be a lifesaver. (I wish something like this had been around when I was growing up. It would've saved me many lectures and my parents many near-heart attacks.) 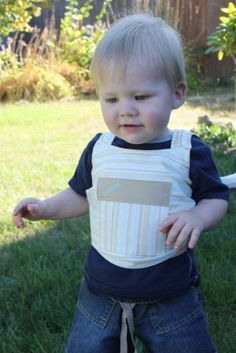 A vest-style harness is more comfortable and secure than a strap-style harness. A front pocket provides a place to store a toy, ID card, beeper, or other stuff. This pattern for a homemade harness doesn't have a front pocket, but it's easy to add one. Tracking devices meant to find lost items can sound an audible alarm, or give a silent signal that may be located with a smartphone. This is a safe way to find someone who can't be seen, but could be heard. Neither of my kids were INVISIBLE... but we sure thought so at times! This was a good read, balanced between the worrisome parts and the comforting parts. I still turn invisible if I forget to pay attention to the consensus timespace continuum. My partner Doug trips over me about once a month. The weird thing? I can see other people, but can't hear them calling me. They can't see me, but if I make a noise, they can hear it and then find me that way. When you say American here, do you mean White? You should say so. When I say American, I mean the kind of mixed heritage that is typical of this country's demographics. It generally looks white, or white-ish, but it often has other things mixed in, which makes me feel that "American" is more accurate than "white." For characters with a more discernible heritage I'll specify French, British, Irish, Swedish, etc. which are all specific flavors of "white." I'm more likely to describe skin as fair, pale, peaches-and-cream, alabaster, etc. than just "white" or "caucasian." Similarly, if someone is darker, I'll say African-American and the African background if known, but it's usually not. Other sources like Haitian or Australian or whatever, I'll name them if they're known. And by known, I mean either the character knows it because their family is fairly concise or is into genealogy, or because I know it from looking at them -- some things just pop out at me. I can usually suss out Native American ancestry. Just to make life interesting, I have a handful of characters with less common combinations, like Indian-British or Chinese-Italian. Turq is Chinese-American, not from having Chinese ancestry, but being an American brought into a Chinese family. • Run and find out! > Sure his name isn't Ricky? Or Rikki? *laugh* No, but that is where I got the idea.